I am writing this from a hotel room in Toronto, shortly after the conclusion of the 2018 Online Global Learning Summit. Rosetta’s presentation tonight focused on project management, and project management is never far from my thoughts when I consider what’s going on in my daily life at work, designing online courses, and managing the project of my dissertation. This is a jumble of thoughts scribbled down during the conference that relate to Rosetta’s presentation (or at least I think they do). They reflect the necessity for project management, and some of the challenges and opportunities of managing online learning projects. Darcy Hardy, Associate Vice President of Blackboard – There is no empirical evidence for the face-to-face classroom. What empirical evidence does exist suggests lecture is not the best way to learn all (or most) disciplines. Instructional design is about creating more engaging, more robust learning experiences. Faculty do not have the same skill set as instructional designers, so how can we adjust online course design practices so that they are not just managing a project, but managing a high-quality learning product? What new uses of the LMS are required? As Hardy suggests, the LMS is too expensive to just be a repository or holding tank. How best do instructional designers, teaching and learning centres, and online learning specialists disrupt/adapt teaching practices? Tim Duncan [lost affiliation and position] wondered what background do you need? This is perhaps the most perplexing question of them all. What background do I need in project management? I have informally been an accidental project manager most of my life. No background – everything I learned about project management I learned informally. Many managers do not have a background in project management, and does this help explain why 60-80% of all strategic change initiatives fail? Should PM be a required course in online learning? We live in a world obsessed with technology, but there is a growing displeasure with our technology Phil Hill, Co-Publisher and Market Analyst e-Literate, said Artificial Intelligence is “not just another iteration of technology.” It’s not. We cannot suggest this is just a difference of degree. This is fundamentally different. There are ethical and philosophical questions we have not answered, but as the Massachusetts Institute of Technology spends $1 billion to work out how technology can change pedagogy, is it reasonable to think we can innovate safely and advance the field without pretending “this is not just another iteration of technology?” Hill said that the advance of artificial intelligence forces the rethinking of the learning organization itself. It forces a rethinking of social structures. As we face the prospect of a learning organization in the age of artificial intelligence, who is doing the learning? Jill Holliday, Resultant / Curiositeer at Learning Advantage Performance a likened the current age to Samuel Taylor Coleridge’s The Rime of the Ancient Mariner. We are surrounded by data by, but just like water, there is not a drop to drink. We don’t know how to make sense or use of our data. As a librarian, I know we have barely moved beyond counting how often our collections are used. At my institution, I have done some work outlining the project management challenge that leveraging our learning analytics presents. The project management challenge (ethics, integration of multiple systems, intelligent analysis, and developing creative interventions) is so monumentally complex, we haven’t gotten started (and we are not alone). Gavin Toole, Superintendent of Learning and Development at Vale, began with the wisdom of Yoda, “You must unlearn what you have learned.” The average shelf life of skills is 5 years. I don’t totally believe this because it depends on how you define “skill,” “knowledge,” and “pattern recognition,” but I think the great unknown does put us into a state of profound unknowing. What will people need to relearn? How can we unlearn some of the straight-jacket structures such as the Carnegie Unit, the four-point grading system, the four-year degree, the discipline, etc. What would a project management process look like to dismantle or supplement any of these structures that may have outlived their usefulness? Mark Milliron, Co-Founder and Chief Learning Officer of Civitas Learning, suggested “we are about to enter a Golden Age of Learning.” I believe this. Conrad and Openo (2018) argue for this pedagogical renaissance. Offering student choice and providing meaningful opportunities for student choice is the heart of our book. I don’t know how long this Golden Age will last. I fear it will be a short blip for reasons outside of the control of technology-enhanced learning. One of the things Milliran suggests is that there is no doom of demography – student activity and student choice is the #1 predictor of success. What innate project management skills (unpacking student motivation) do these students possess? Stephen Murgatroyd, Chief Innovation Officer, Contact North, would have been perhaps the most controversial speaker if he wasn’t so British, warm, and hilarious. Some of the things he said: Dear faculty, you still matter, not just as much. And you’re not as smart as you think you are. “If we’re so smart, why are we under surveillance?” Because we are all under surveillance and we are all dancing with robots, which is causing a human/faculty identity crisis. Is the real hope for faculty to transform into “ambiguity specialists?” Advocates for the learner who demand evidence for change management who are the project managers shifting ideas about what learning? Who demand proof through research and evaluation that pedagogical innovations demonstrate great quality and integrity? How do we, as Brian Desbiens, Education Consultant Canadian Digital Learning Research Association and Former President of Sir Sandford Fleming College said, manage the collision between those who are trying to “hold together the past” and those who are “navigating a new future”? How do we project manage that big change at time when organizations are suffering from initiative fatigue? Rosetta’s presentation, juxtaposed against the Global Online Learning Summit, provides some enormous things to think about. This appeared today on Inside Digital Learning. It’s the best coverage we have received for the book so far. Online learning offers instructors an opportunity to rethink their approach to assessment. A new book hopes to spur that conversation. This is the abstract for a paper I am currently seeking publication for. Baldwin, Ching and Friesen (2018) recently presented a grounded theory model of online course design and development. Their analysis shows that instructors roughly follow the ADDIE (Analysis, Design, Development, Implementation, and Evualation) instructional design model even though instructors do not follow it in a rigid or formulaic fashion. Their model is grounded in the experience of practitioners, and this author’s experience agrees with their findings and the implications of the study. In accordance with their methodological approach, this online instructor has taken a personal approach, as a fellow practitioner, to propose a revised and expanded model based on his online instructional design experience that may be more suited to the everyday context of online course designers. Baldwin, Ching and Friesen’s model is a strong starting point to fill in the paucity of research on how instructors design online courses in practice, but it may be incomplete because it does not take full account of the disciplinary context or an instructor’s beliefs about teaching. Other missing elements might include how to structure students for maximum engagement, building an integrated digital learning environment beyond the LMS, and the utilization of course analytics and instructor judgment to validate course design. This expanded model requires addition research for validation and verification. The structure of the paper outlines the suggested additions, defines that element, and then explains how it impacted my practice. 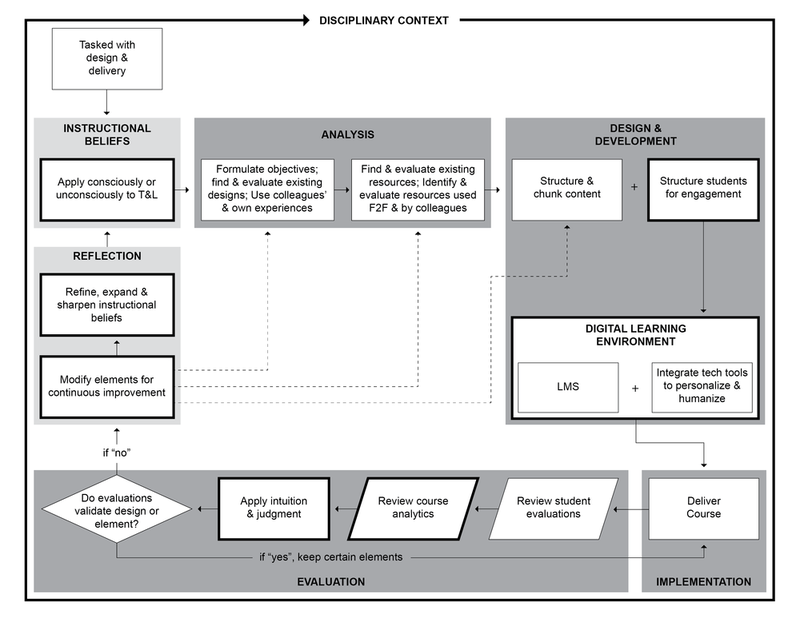 Openo’s expanded view of Baldwin, Ching and Friesen's (2018) grounded theory of online course design and development. Andy Warhol once said, "The acquisition of my tape recorder really finished whatever emotional life I might have had, but I was glad to see it go. Nothing was ever a problem again, because a problem just meant a good tape. . . . An interesting problem was an interesting tape. Everybody knew that and performed for the tape. You couldn't tell which problems were real and which problems were exaggerated for the tape. Better yet, the people telling you the problems couldn't decide anymore if they were really having the problems or if they were just performing." I feel the same way about word processing. It has killed whatever writing life I might have had. I shared this with my cohort last night - that recently, after my son brought home the plague and I was sick in bed, I spent a few days reading about dissertations, research, and picked up a pen and my research journal and just started writing and doodling. So many aspects came clear, focused, and settled for me. I could see my way forward, and as a result, I was going to build this into my nightly routine. Today, I got the best message from one of my colleagues. I wanted to thank you for discussing your experiences about your ideas when you were ill. It got me to thinking about handwriting and how it is so helpful to disseminate ideas. I have been struggling with really clarifying my ideas. I know what I want to do to, but I can never nail down the precise language the way I would like to. I keep rewriting it in different ways, trying to make it click. After hearing your story on Tuesday, I decided to keep a manual dissertation journal so I could get messy and be able to record my ideas in whatever form they arrive in...doodles, mind maps etc. As you spoke, I thought Jason is right, typing is so linear in nature, in some ways it was holding me back. So, thanks for the reminder, I am not there yet, but my messy writing journal has been helpful. I am glad this insight turned out to be as useful to her as it was to me. Every night, before I go to bed, I re-write the purpose of my study as I understand it today, and any new thoughts that I have had regarding the project and what I want to know. Drawing today's mind map is also useful, because there are a lot of paths that I want to travel, but will not travel in the dissertation. I will make note of them - "Future research should explore. . . ." In my case, for example, as much as I want to explore the experience of online contingent faculty in Canada, especially those who teach at multiple institutions, I won't be doing that. Is it worthwhile? Absolutely, but I am not doing it. Why? Well that comes back to the journal. Write yourself that question again and again. Why? That's your justification. That's why this is included and this excluded. I hope I get to that study, but that will be after this one. When I just write on the computer, it is a never-ending process of editing and self-censorship, or leaving things on the cutting room floor. To enjoy this process (and I really want to enjoy this process), I need to build activities that are more process-oriented and less product-oriented.